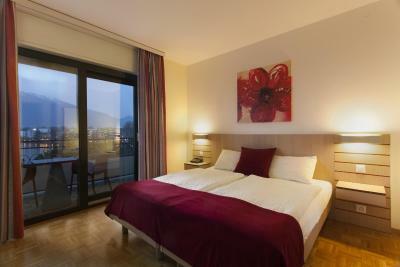 Lock in a great price for Hotel Geranio Au Lac – rated 8.6 by recent guests! The Hotel Geranio Au Lac is spotlessly clean, has a great breakfast, is quiet, and is in a great location with shopping and the train station within a short walking distance (behind the hotel is the train station, and the hotel has a back door at the station level on the second floor, to make it even more convenient). 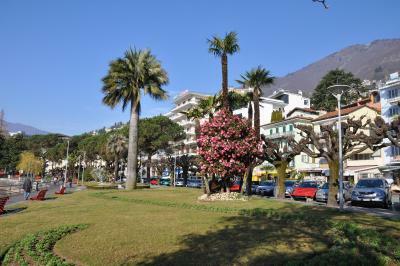 Hotel Geranio gave us a Ticino card for free bus and train service and discounts for attractions in the Locarno area. What was most appreciated by us was the staff, from the most gracious and helpful people at the front desk to the breakfast room staff, everyone was efficient and friendly. We left a pair of sunglasses in the room, and the hotel, immediately after we contacted them, said they would mail the sunglasses to us. Great breakfast buffet and the view was splendid. 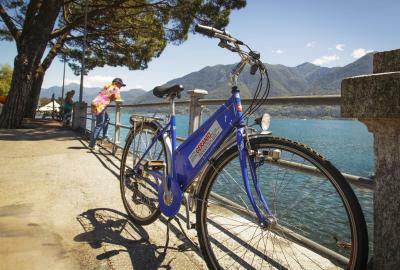 Loved the complimentary bicycle allowing me to cycle all the way to Ascona and back. Also loved the free travel on public transport pass for my stay (which apparently is a given for anyone staying in a hotel in the Ticino). The location, and the staff are especially friendly, and very helpful indeed! Wonderful staff. Delicious breakfast. Convenient to train and ferries. Great view of the lake from bedroom. An excellent place to stay ,directly on the lake! The staff was absolutely fantastic! Highly recommended ! We had a room with a balcony that looked out onto Lake Maggiore. 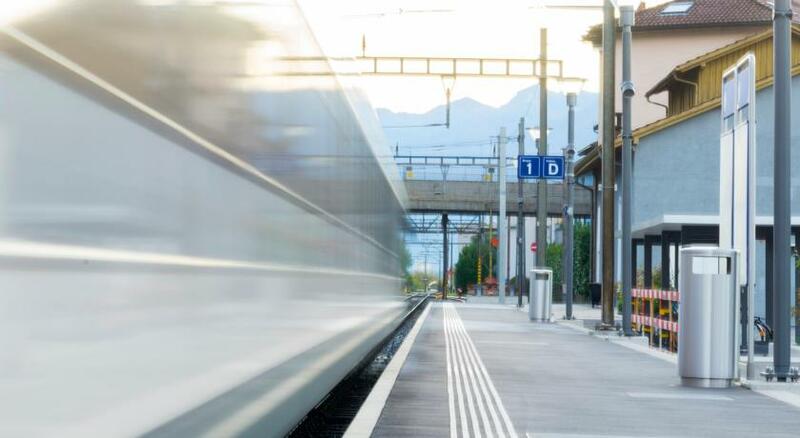 The location is close to the train station. There is a lakeside promenade that runs along the shoreline. To cool off we walked down to the Lido- a great swimming area with pools, a beach, slide, lockers, etc. I think it was 13 francs for adults, but was worth it as it was so hot. We had a balcony over looking the lake, as it was our first visit to area we were charmed. Heard about hotel from a woman who lived nearby and it was a find for price. Now will share that find with you. Breakfast was excellant. Free bikes. Easy walk from train station..no need for car. The location of this hotel on the lakefront is its main advantage and also that it is designed with balconies jutting out at all angles to provide lake views to a maximum of rooms. It’s also situated on a quieter, non-main street. 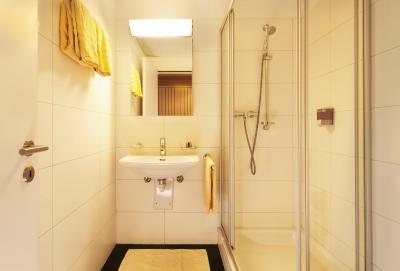 Otherwise, it’s a basic facility with modest sized rooms. It’s very clean. The staff is friendly and helpful. 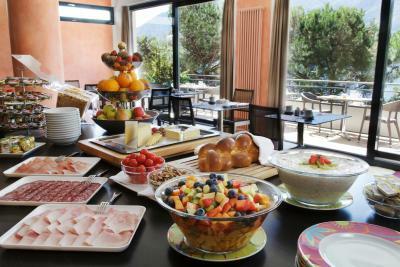 Breakfast offers a good spread of typical Swiss breakfast fare, the breakfast room is bright and has a long balcony for outside eating. This is a good place to stay for the price if you don’t plan on spending any time in your room, which has an American “motel feel” to it (plastic chairs, laminate furnishings). It's basic. Hotel Geranio Au Lac This rating is a reflection of how the property compares to the industry standard when it comes to price, facilities and services available. It's based on a self-evaluation by the property. Use this rating to help choose your stay! 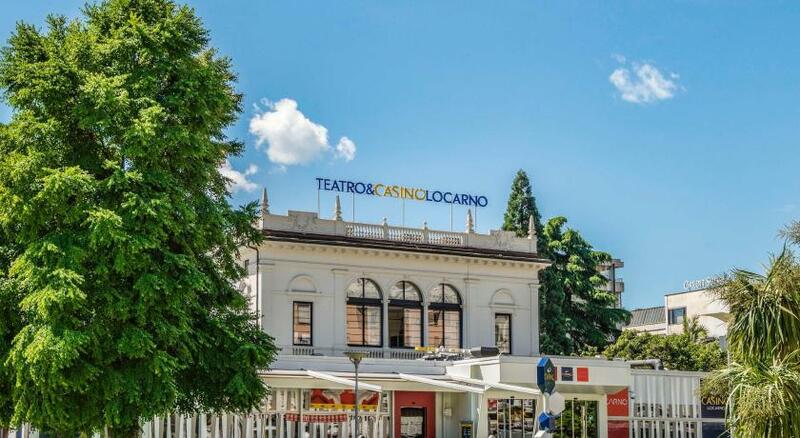 One of our top picks in Locarno.Set on the lakeshore promenade of Lake Maggiore, Hotel Geranio Au Lac is only 350 feet from the Locarno Train Station and the city center. It offers a breakfast buffet. 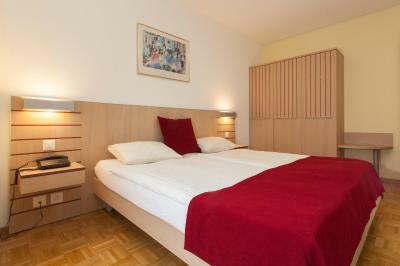 All bright and spacious rooms are furnished in Mediterranean design and provide a balcony, a bathroom and a TV. Some also provide air conditioning. 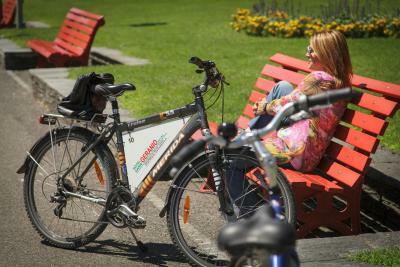 Guests can rent bicycles free of charge at the Geranio Au Lac hotel or get active at the on-site fitness room. 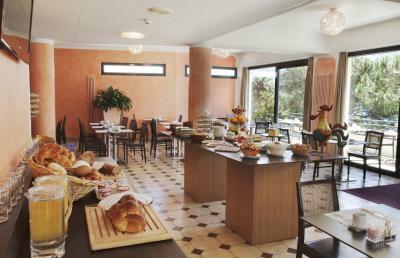 The breakfast room of the Hotel Geranio Au Lac enjoys stunning views of the Lake Maggiore. Several restaurants serving Swiss and international cuisine are in the immediate vicinity. Covered parking is available nearby. Muralto is a great choice for travelers interested in lakes, mountains and hiking. 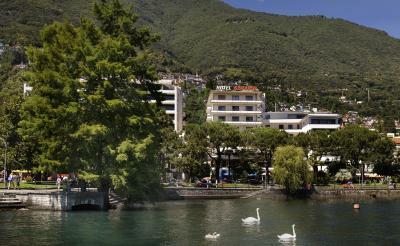 When would you like to stay at Hotel Geranio Au Lac? All rooms has a private balcony and a flat-screen cable TV. This room has 2 bathrooms, a flat-screen cable TV and a balcony. This room features a private balcony overlooking the lake, and a flat-screen cable TV. 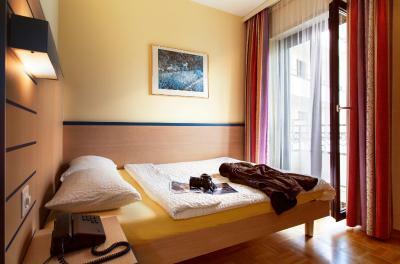 Hotel surroundings – This neighborhood is a great choice for travelers interested in lakes, mountains and hiking – Check location Excellent location – show map Guests loved walking around the neighborhood! 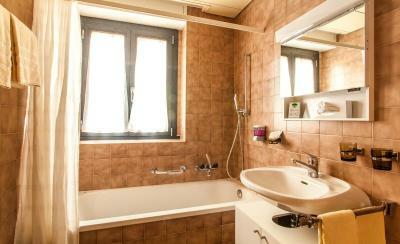 House Rules Hotel Geranio Au Lac takes special requests – add in the next step! 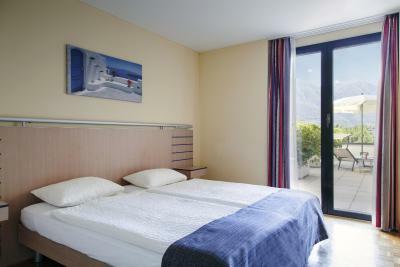 Other Hotel Geranio Au Lac accepts these cards and reserves the right to temporarily hold an amount prior to arrival. 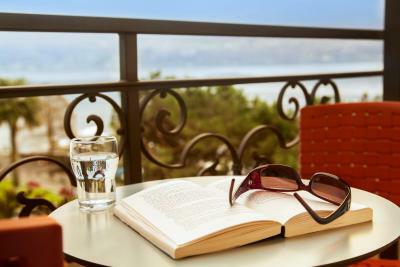 Hotel Geranio Au Lac accepts these cards and reserves the right to temporarily hold an amount prior to arrival. 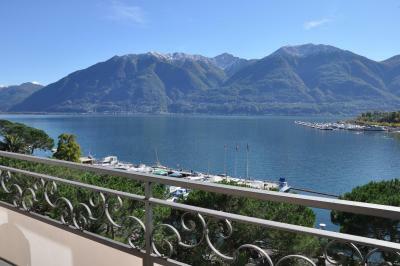 Very good location - view from breakfast room/balcony towards the lake, splendid. Sound breakfast buffet, very nice staff. Very helpful reception, really made good suggestions on our stay. Nice breakfast and very friendly staff. 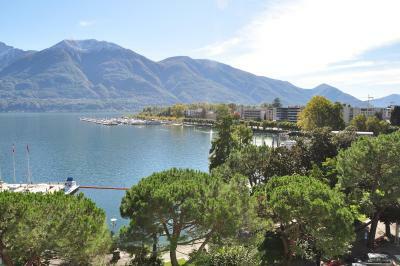 View from the room and balcony to the lake to the Lago Maggiore is amazing! 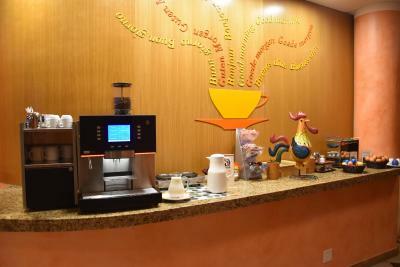 Very good breakfast, tee/coffee for free 24h. Free bicycles rent for the hotel guests. The location could not be better. 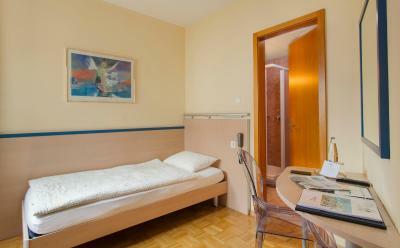 Good location, large facilities, a gym, fair breakfast, view over the lake, free bycicle rent. 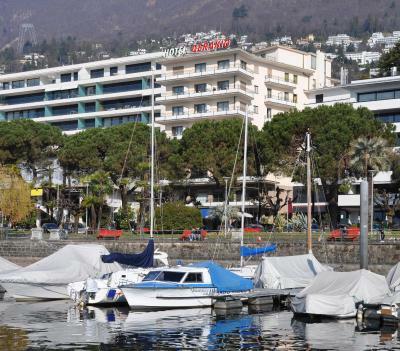 The lakefront accommodation properties in Locarno were always out-of-my-budget range in the past....but, lo and behold, the Hotel Geranio Au Lac made it possible. I truly enjoyed my two-night stay.....including the availability of complimentary bicycles to enjoy a tournée of the bay before supper. I also have to extend my compliments to the front-desk staff.....most helpful with suggestions to make the stay as pleasant as possible. The room was a little small but since I was alone it wasn't a big deal. Might be a little small for two people. Comfortable bed, small but welcome balcony. No air-conditioner. No mini-bar. Useless hair-dryer (no socket in bathroom or near the mirror). Very strange for three stars hotel. Good location. Clean big room. Friendly staff. Room on 6th floor had very poor ventilation. Notably hotter and stuffier than lower floors. Good internet. Friendly, helpful reception. Fresh fruit salad at breakfast. Beautiful location. Great view on the lake! The staff was so gentle and kind and always there to help you. Nice view, convenient location, helpful reception, good breakfast.